Federal Government of Nigeria have succeeded in pressuring Senator Ebyinnaya Abaribe to ask for adjournment of the ongoing case of treasonable felony between Nnamdi Kanu and 3 others who have so far spent more time in prison than those convicted of similar offences. DSS knows they has no choice but to release David Nwawuisi, Benjamin Madubugwu and Bright Chimezie Ishinwa do they decided to blackmail and intimidate Senator Abaribe into getting his lawyer to write to the court seeking yet another adjournment. This level of wickedness is unheard of anywhere in the world. Not minding that Justice Binta Nyako who is a Fulani woman, Attorney General of the Federation Malami Fulani man, DSS Director General Fulani man, lead prosecutor Labaran Fulani man all have natural hatred towards Igbo people and Biafrans at large. Keeping David Nwawuisi and Benjamin Madubugwu in further detention when they have spent more time in jail than those convicted of similar offences is an indescribable evil. 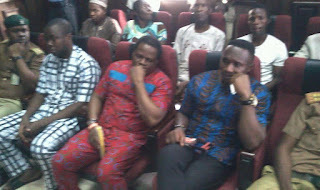 DSS is under court order to release Bright Chimezie Ishinwa but they have steadfastly refused. He has been held in underground detention at DSS headquarters. They are releasing Boko Haram suspects while they keep detaining Biafrans. Even when we want to go to court to clear our names, they use adjournment after adjournment to keep Biafrans in jail. We must say no to this!